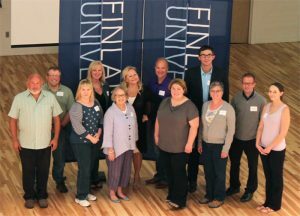 The Finlandia Alumni Board (FAB) is accepting nominations for new members. Interested alumni can self-nominate by emailing Olivia Myers at olivia.myers@finlandia.edu with their name and a few sentences of why they would like to be involved by September 17. As an advisory group to the university, the mission of the FAB is “the promotion of the vision, mission, goals and programs of Finlandia University.” The goals of the FAB include advising the President and Board of Trustees of the University with regard to the mission, vision and long range plans of the University in relation to the involvement of alumni in the life of the University, provide national leadership for the Finlandia University Alumni Association, promote participation by alumni in the ongoing life of the university including participation in alumni activities, the curricular and co-curricular life of the university and off-campus activities sponsored by the University, and assist and support university staff in the promotion of the University among alumni, prospective students and donors. The FAB’s most recent project involved crowdfunding $45,000 to restore the Old Main roof in 2016-17. They look forward to deciding what initiatives to tackle this coming year at the annual meeting, which will be held on FinnU’s campus on September 28-29.